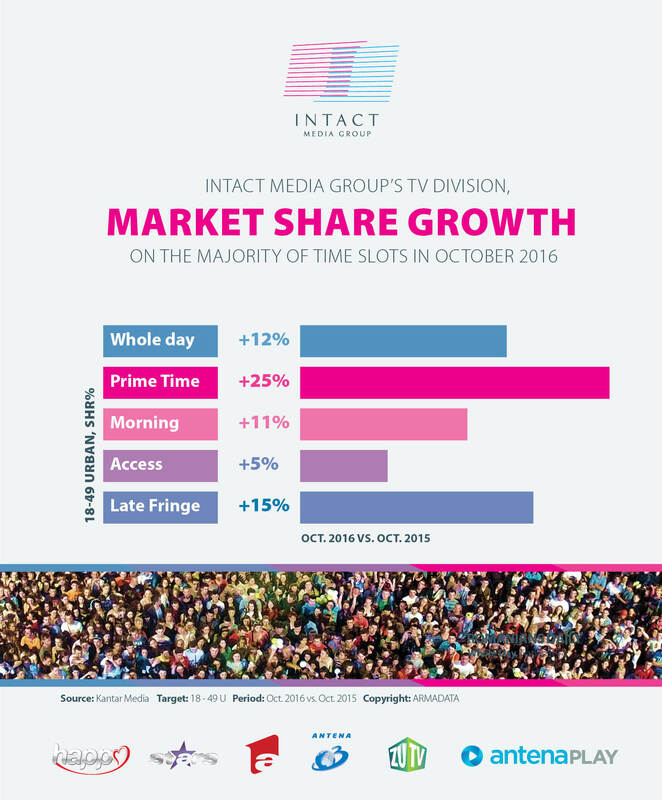 October saw audience performance on most time slots and on all targets ( commercial, Urban and National) for Intact Media Group’s TV division, compared to the same period last year. Market share appreciation was a common denominator for both TV division as well as for each individual TV station. Commercial target: Intact’s channels have market share appreciations on most time slots, amongst which Prime Time (+25%) and Whole Day (+12%). Urban All: the TV division is leader on most time slots, amongst which Whole Day and Prime Time. Market share appreciation occurs on most time slots, compared to October 2015. Național: Intact Media Group’s TV stations hold the first position during Whole Day, Prime Time, Day Time, Access and Late Fringe, and show appreciations compared to October 2015 on all time slots, including Whole Day ( +11%) and Prime Time. (+21%). Commercial target: the channel audience is on an upward trend, showing appreciations on most time slots, including Whole Day (+21%), and Prime Time (+30%). The market share is also on an ascending track on most time slots and all targets, including Whole Day (+19%) and Prime Time (+34%). Antena 1 is market leader during Access, (when the reality show “Acces direct” and Observator news bulletin are aired). The super productions iUmor, Chefi la cuțite (both with a 100% leadership percentage during their airtime), X Factor, Te cunosc de undeva and În puii mei were the most watched productions in October. Urban All: is market leader during Day Time and Access and shows market share appreciation on most time slots, including Whole Day (10%) and Prime Time (22%). Național: is leader during Day Time and Access, with market share evolution on all time slots, amongst which Whole Day (18%) and Prime Time (28%). 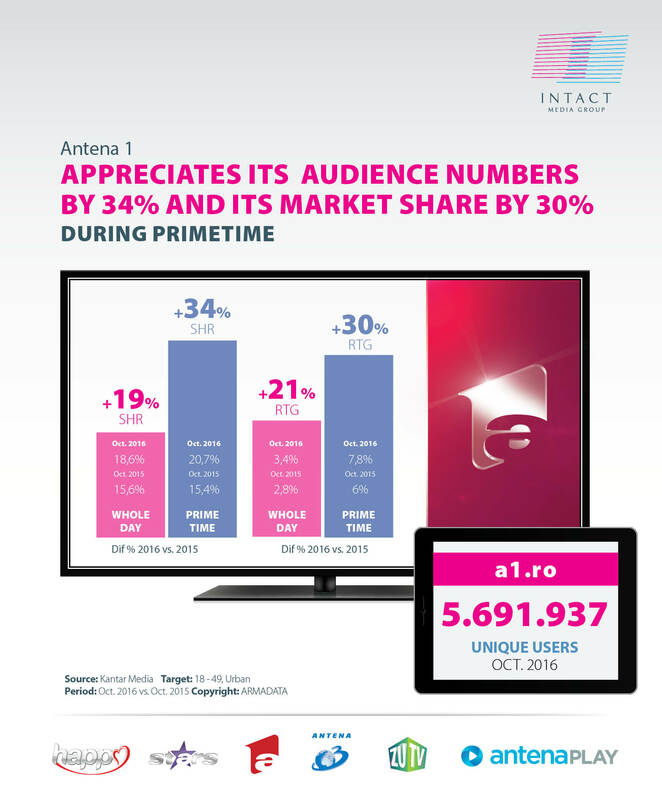 Antena 1 was watched in October, during Whole Day, for at least one minute, by 8,2 million Romanians. A1.ro had over 5.6 million unique users in October. 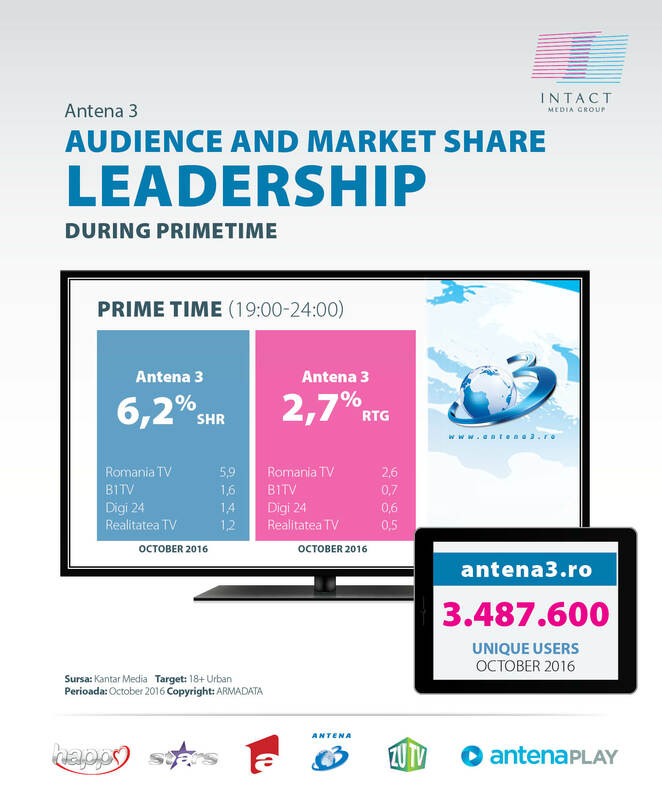 Antena 3 is leader of the news niche in Romania in October on the most important time slots, amongst which Morning and Prime Time. Antena 3 was watched by 3.8 million viewers, for at least one minute, during Whole Day in October, on the 18 + target (specific to the news niche) and there is 5% audience appreciation during Access. “Sinteza Zilei”, “Adevăruri ascunse”,”In premiera cu Carmen Avram”, “Subiectiv” and “Punctul de întâlnire”were amongst the top productions in October. Antena3.ro had over 3.4 million unique users in October. Antena Stars, the only TV channel dedicated to showbiz, was watched in October by more than 3.2 million Romanians, on the national target, during Whole Day, for at least one minute. Antena Stars’ most watched productions in October were “Capcana Seducției: Test de Fidelitate”, “Alege Dragostea”, “Agentul VIP” and “Răi da’ buni”. Happy Channel, the Group’s channel addressed to women, has significant market share and audience appreciation compared to last year, both in October, but also in the first eight months since its launch. 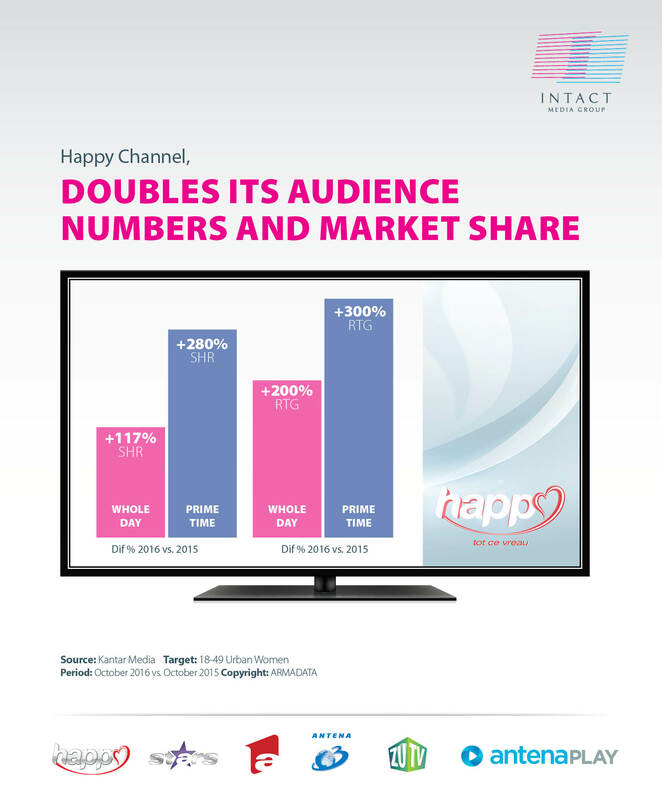 Compared to October 2015, Happy Channel has significant audience appreciation on most time intervals, on the commercial target, doubling its audience numbers during Whole Day and tripling it during Prime Time. Other important appreciations occur during Access (+200%) and Day Time (100%). Prizoniera dragostei (Never let go), the Turkish series Elif, “Muchacha Italiana viene a casarse” and “Un camino hacia el destino” were October’s most watched productions. ZU TV, the channel that addresses the young generation (15 – 34 years old, urban population) has caught the audience’s eye with productions such as Most Wanted, Morning ZU, ZU Party Romanian Tour, ZU Trends, Bobiceag și duba de artiști. October translated into performance for the online division as well. Digital Antena Group occupied two positions in top 10 all Romanian websites (www.a1.ro and www.spynews.ro). A1.ro is leader of the entertainment category with more than 5.6 million unique users in October and aims to secure a spot in top all websites in .ro. Almost 10 million Romanians watched Intact’s productions during Whole Day, for at least one minute, on national level, during October of 2016 and more than 7.3 million during Prime Time.